Participating in a First Crush wine making event is a must! 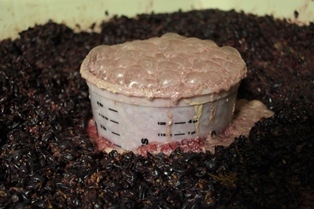 OK… In wine making, the must, composed of crushed grapes that are void of stems, resides at this initial stage in large primary fermenters. In the pail is what we call the starter. It is a mixture of a small amount of must, special yeast, yeast nutrient and warm water. When the starter and the large volume of must in the fermenter reach a 10 degree differential, the starter is introduced to the must to inoculate fermentation. In one year we will drink this wonderful wine… if we must! Diane and I just returned from a way too short week in Florida. We piggybacked our trip to go to our annual winery conference in Lancaster, PA. So now our batteries are recharged, and we are ready to face the unknowns of 2016 at First Crush Winery. Many of you reading this update were supporters of mine and COOP participants prior to the inception of our real winery. Little did we realize back then, especially me, what would follow? I had no grand plan, however the converging realities of life apparently set the stage, including the great fun we had making wine together, the amazing wine we made, the timing of the slowing down of my days in eye care, and last but not least, the encouragement of so many of you to bring our wine making efforts to the commercial level. Indeed, those early times were special times, but for sure, so are our times now, and so are the times to come. I sincerely thank you all for your support and continued encouragement. As I have often expressed that the COOP is the foundation of First Crush Winery, and it always will be. It makes our winery very different and special. Sure, most wineries have a wine club, whereby, wine is quarterly distributed at the whim of the winery, but that’s not at all our COOP model. Here’s to making great wine, having fun together, and long live our COOP, or at least until the day I require a sippy-cup to enjoy our wine! In the past, when Diane and I went on a vacation, I always pleaded for her to pack less. “Please, instead of two large suitcases and two carry-ons, for once, how about one less large suitcase?” I tried, but it never did any good. In a good marriage a smart man learns to surrender to the inevitable. That’s what we do! But, this year, there was a complication. After Florida we were flying to Philidalphia to attend our annual winter winery conference in Lancaste, PA. Habitually, when we go to our winery conference, one the first night we meet our growers Ron and Rick Lanza and Frank Musto. It’s time to reminisce on the last vintage year while enjoying their hospitality of cheeses, Italian antipasto meats, bread, and go figure, their wonderful Suisun Valley wines. The complication was that I always bring bottles of our latest zin and cab for their evaluation and bragging rights. In addition, the following evening we are fortunate to be part of a select group of supporting wineries that share their wines at dinner. Since we were flying, how was I to get wine to Lancaster? The last time we were in Napa, we purchased a special case specially designed with wheels to transport wine on a plane via check-in. The case holds 12 bottles, but I did not need that many for the conference. So, what would you do? Here’s the brilliant part… were going on a vacation. All I had to do was convince Diane that along with the two large suitcases and two carry-ons we now need to take this third large case filled with wine. Did she whine? Of course not, she’s a wine maker’s wife, and we were going on a vacation. We’re so compatible! Buy the way, if she objected, my ace in the hole was the fact that if the airline charged us for the third large item, we would not have to buy wine for our time-share condo during our vacation. The Jet Blue attendant curbside liked his tip, and that resulted in no extra fees. Life is and was good! At the conference, we took classes for two days and learned a few helpful pearls. Always do. I have always felt that if you don’t learn something new each day, it’s not a good day! I always look forward to the exhibits, but it’s a dangerous place, due to all the new toys to ponder over. It’s always a test to balance emotion, practicality and need. I could not resist new computerized technology to improve our wine laboratory analysis in regard to more accurate acid measurements and pH. Technology has always been the cornerstone of my optometry practice, it seems natural to bring it into my winery world as well. I hope its late winter, because after a trip to Florida, it better be late winter. We do set our clocks ahead this weekend, but another thing that gives me hope is that the winery phone is ringing, ringing, ringing. People are booking tastings, bachelorette events, birthday parties, fundraisers, etc. That’s become our new life. That’s another reason the COOP is my favorite. Last season we suddenly found ourselves in the entertainment business. No complaints yet, but we may need help with that aspect of, life in a winery, one day. Keep in mind that all wines are in and ready and all fantastic. Sauvignon Blanc (Star Spangled), Rosè (Innocence), Sangiovese (Rapture), and of course, our big Cab, big Zin and cranberry wines. As a reminder, COOP members can pick up additional wines at their COOP reserve anytime. On average, that’s a $45.00 per case savings over our retail pricing. To get you up to date, I am aiming for the date June 11th to bring your date. “Cajun Bob… start rehearsing.